She taught us about a variety of NZ plants, but one stands out above the rest through its many healing properties – the ‘KAWAKAWA’ has been known to Maori for generations as ‘the pharmacy of the forest’. The Kawakawa is a small tree that grows throughout New Zealand. It is usually found on the edge of the bush, in partial shade. It grows up to six meters high and is a densely branched, aromatic tree with large, heart shaped, emerald green, fleshy leaves. The leaves are often eaten by the native looper moth, which makes it even more powerful due to the plant having to work that little bit harder to increase it’s immunity. 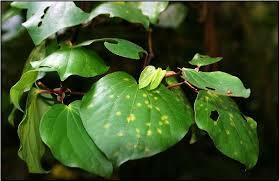 The Kawakawa tree is significant and sacred to Maori. It is significant for its many and varied traditional herbal curing properties and is sacred for its use from conception, then through one’s life, through to one passing on into the spiritual realm.